North Korea's state media are projecting a new hands-on, down-to-earth image of leader Kim Jong-un, picturing him in pants smudged with dirt. State TV on Monday showed Kim inspecting a factory, the seat of his pants smudged with dust. He was visiting a chemical fiber factory in Sinuiju, North Pyongang Province near the border, and had been sitting on a cement ledge looking serious as he talked to factory managers. It is a departure for the state media to show Kim looking anything but stiffly immaculate. 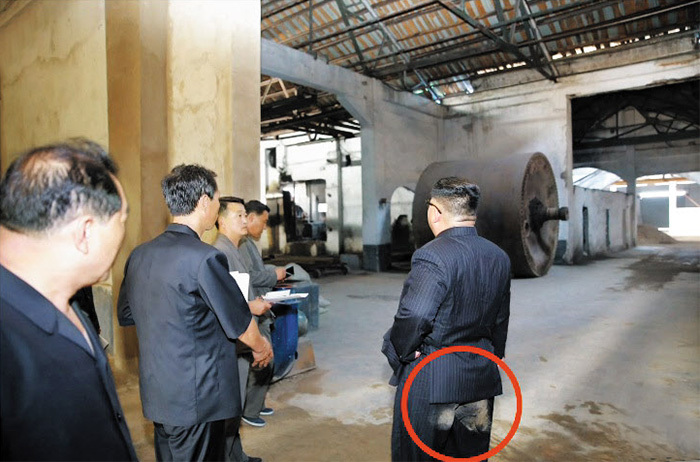 The seat of North Korean leader Kim Jong-un's pants is smudged with dust during a visit to a chemical fiber factory in Sinuiju, North Pyongan Province in this video grab from [North] Korean Central TV on Monday. Kim also apparently has a horror of dirt. During last month's summit, Kim used a sterilized pen and chair during the signing of an agreement with U.S. President Donald Trump. One researcher at a state-run think tank said, "Kim harangued workers about the sorry state of the factory, and by showing his clothes smudged with dirt, the state media seems to be stressing how poorly the factory is maintained." But the development is in line with efforts to show Kim as a more down-to-earth leader. 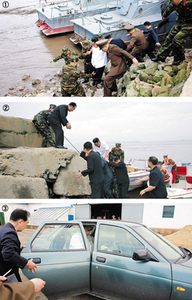 Earlier, Kim was shown being driven around in a battered car and unbuttoning his jacket during his on-site inspections of factories in Sinuiju.